Whatever your thoughts on the wisdom, or execution, of the Seinfeld reunion on the season finale of Curb Your Enthusiasm, it’s impossible to deny that Larry David playing George Costanza — literally, Larry David playing him, in a way that you wonder if he has wanted to all along — is one of the funniest scenes either show ever produced. In a meta-show, it was the ultimate meta-moment: Larry David playing Fake Larry David pushing aside Fake Jason Alexander from playing the character Larry David based on Larry David. Stuffed into khakis and that famous sweater, Larry’s George is a caricature based on a caricature based on a caricature. It was all anyone could have ever hoped for from the Curb/Seinfeld reunion: Lunacy and iconic-television history colliding and exploding. The scene was so funny that it almost made you forgive the finale’s occasional clumsiness, with the re-igniting of Larry and Cheryl’s marriage sort of sputtering to its final conclusion. (Larry was more concerned with being a “Wood Detective” than finally having his wife back.) The Seinfeld scenes were more nostalgic than knock-down hilarious — seeing the gang back at the diner was enough to make you leap off your sofa — and the subplot with Mocha Joe and attack dogs felt like filler, and beside the point. Larry does get Cheryl back, but as much as the show has labored to show how much Larry really does love her — and considering how Larry David’s real-life divorce inspired the Cheryl divorce plotline in the first place, one suspects he wrote this reconciliation as a fantasy — the same way TV–Larry David wrote his into the fake Seinfeld reunion — the way it ended was awfully perfunctory. But compared to how that other Seinfeld finale ended … well, you couldn’t help but think that wasn’t the point, anyway. Rather than the stated plotline of Larry doing a Seinfeld reunion to get Cheryl back , we think the real Larry David was actually using the getting-Cheryl-back storyline as an excuse to do the Seinfeld goodbye he wanted (and felt the audience deserved) all along. We suspect that’s because this season was about an entirely different, and far more satisfying, love story: the one between Larry David and Jerry Seinfeld. (We can no longer tell which is real and which is fake.) Their scenes together all season were relaxed and off-the-cuff funny, two old, old friends, two “twins in the womb” (as Jerry calls them) thrilled to be working together again. Since Seinfeld went off the air, Jerry Seinfeld has lost a bit of his edge, doing kid movies, appearing in silly commercials and promoting his wife’s cookbook. Seeing him back with Larry made one sense he had returned to familiar, comfortable terrain, with his old pal, just trying to be funny again. These are two lifelong friends who, when they work together, are wholly at ease and consistently uproarious. 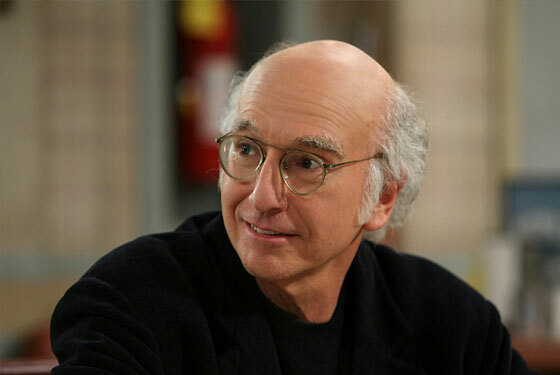 Is it too much to ask that a season eight of Curb just involve Jerry and Larry hanging out? Maybe we can bring this meta full-circle, and make it all about them trying to pitch a show about the making of a show about Larry David and Jerry Seinfeld trying to pitch a show. We would definitely watch that. Alan Sepinwall agrees with us, and hopes Curb will continue with Jerry as a regular cast member. Jace Lacob at the L.A. Times is the only person in America more interested in the Larry-Cheryl dynamic last night than the last episode of Seinfeld.